Born into a poor family, Reese “took early to people- watching and to song,” said The Washington Post. She sang about scenes unfolding outside her Detroit home—neighbors having affairs, a husband hitting his wife—until, she said, her mother “had to nail up the window.” Reese became the star soloist in a local junior gospel choir, and at age 13 went on tour with legendary gospel singer Mahalia Jackson. That gig would last for five summers. 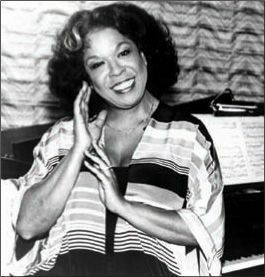 Her big break came in 1951, when Reese won a weeklong singing residency at Detroit’s Flame Show Bar, said The New York Times. “One week turned into months, a manager spotted her, and she moved to New York City.” Signed by Jubilee Records, Reese had her first Billboard Top 10 hit with the 1957 ballad “And That Reminds Me.” She made her TV acting debut as a nightclub owner on The Mod Squad in 1968, and the following year helmed Della—the first national variety-talk show to be hosted by a black woman. The show was canceled after one season, but Reese went on to star in scores of TV movies and series, including Chico and the Man and The Royal Family.